Oct 11 – Come to Bike-toberfest – lots of biking events for all ages! This year McCloud’s annual Bike-toberfest will be on Saturday, October 11! Lots of fun and riding events for all ages and levels. McCloud Dam Road Bike Ride – 30 miles (2-3hrs). Moderate to Difficult. This picturesque ”rolling hills” ride begins on Main Street, McCloud, through town onto Squaw Valley Road. The total ascent is 2,139 feet, with a maximum of 3,376 ft. and 6 category climbs. Hilly ride takes you through meadows, aspen trees, above McCloud Lake to the Dam. The return ride has a spectacular view of Mt Shasta and fall colors. Full service Rest Stop at the Boat Launch and SAG wagon available. McCloud Scenic Road Bike Short Ride-12.5 miles (1-2hrs) Easy to Moderate. The ride begins on Main Street, McCloud continues through town onto Squaw Valley Road. The ride out turns around at Rest Stop at Friday’s RV Resort is a gradual downhill. The return ride is a gradual uphill to downtown with one more difficult climb near town. Rest Stop with food, water and SAG wagon provided. 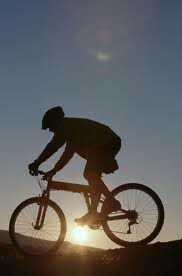 McCloud Mountain Bike Short Ride-12 miles (1-2 hrs) Easy to Moderate. This ride begins on Main Street through town, crossing Pilgrim Creek Road and onto Great Shasta Rail Trail. Rest stop and turn-around at Mud Creek Bridge returning to Main Street, McCloud. Call to reserve a room and get more information! Posted in McCloud Events, McCloud Hotel News | Comments Off on Oct 11 – Come to Bike-toberfest – lots of biking events for all ages!